It is well established that certain anthropogenic noises have a severe effect on whales. Many sounds that humans introduce into the sea today are without precedent in the evolutionary history of marine mammals and other ocean life. Seismic testing associated with oil and gas exploration, military SONAR, and other industrial sources of ocean noise have injured or killed dolphins and whales in many instances. Additionally, behavioral impacts can also be severe, with animals interrupting feeding, nursing, or reproductive activity to flee from disruptive or painful sounds. There is also evidence that whales may be subject to “masking,” where some types of noises interfere with their ability to communicate with each other. As the military and industrial producers of these sounds are required by law in some countries to prevent impacts to marine mammals, there has been considerable debate and litigation in response to this continuing problem. Various mitigation schemes have been proposed, but they have not proven effective in eliminating harm to whales. Despite a wealth of information demonstrating the need to address multiple characteristics of sound, such as form, frequency, and periodicity, mitigation levels have thus far focused only on signal amplitude, or volume. 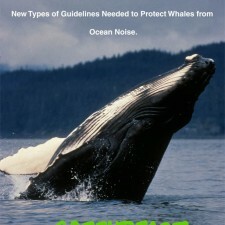 Many of the studies have also been focused on physiological thresholds such as “threshold shift” using sinusoidal-derived signals which may not accurately reflect the types of anthropogenic noises to which whales are exposed.1,2 Mitigation levels based on these thresholds and signal types are often higher than known behavioral thresholds. It is clear from the literature that marine mammals avoid certain types of signals at significantly lower amplitudes than naturally occurring signals or other types, frequencies and forms of anthropogenic signals. 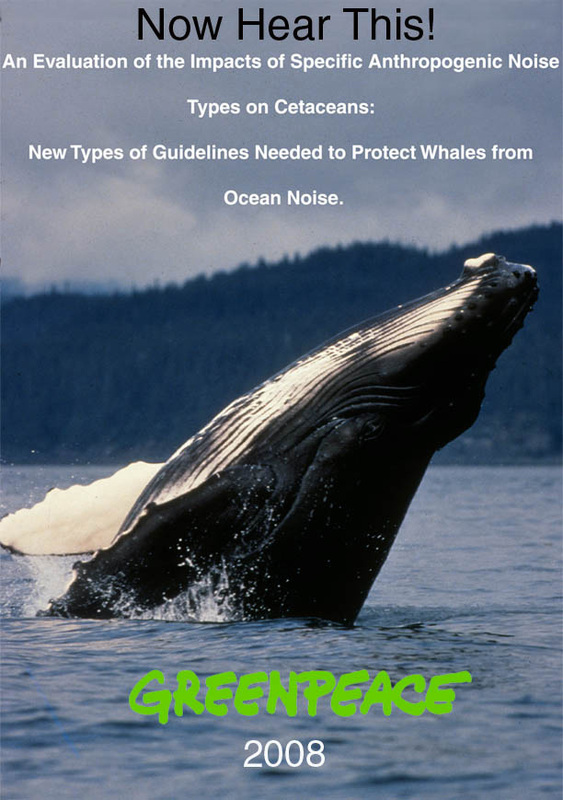 This paper presents data on signal-specific biological responses of cetaceans and calls for incorporation of signal types as well as decibel levels when establishing noise exposure criteria for whales. Given the existing evidence that cetaceans are adversely impacted by a range of noises far below current mitigation levels, a more precautionary approach is needed. This paper presents science-based, interim noise exposure criteria for the onset of direct physical injury in fish exposed to the impact sound associated with pile driving. This paper provides an objective, scientific assessment of pile driving exposures which are injurious to fish. It does not explicitly consider policies of regulatory agencies which are based on mandated legal requirements and consequently result in the application of sometimes limited information for management decisions. 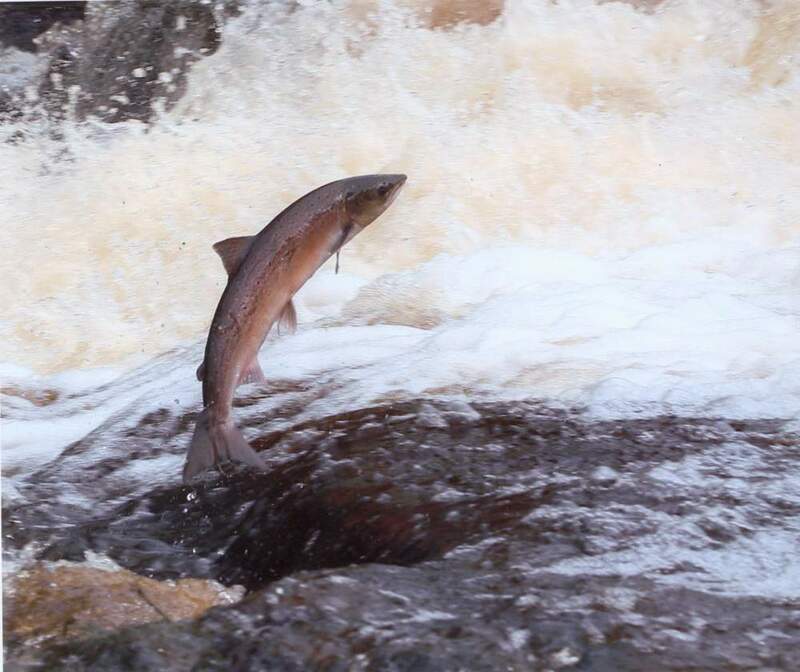 The authors recognize that fish may respond to pile driving without experiencing injury, but the paper does not directly address behavioral responses of fishes or other sub-injurious auditory effects in setting interim criteria, largely due to the absence of underlying information. The interim criteria presented here are based on the best science available at the time of writing. We have used professional judgment and, for the most part, the existing, peer-reviewed literature, to make conservative decisions where data are lacking, or present a range of options. That is, in the face of uncertainty criteria are set at exposures somewhat lower than the present peer-reviewed literature suggest may be the levels that would result in the onset of injury. A dual criteria approach is developed which includes an interim single-strike criterion for Sound Exposure Level (SEL) combined with an interim criterion for Peak Sound Pressure Level. Possible applications of SEL metrics to account for the accumulation of exposure energy across multiple exposures are discussed, although it is pointed out that the available data supporting multiple strike criteria are highly limited. The assumptions on which the criteria developed here are based are listed in an Appendix along with suggestions for the research that is needed to test the assumptions. 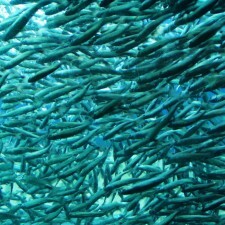 Because of the high likelihood that this research will call for modifications of the interim criteria, the criteria presented must be clearly understood to be provisional and part of an iterative, self-correcting process that, along with policy guidelines, will continue to evolve for decades as new data become available. Get in contact with Steve Gough via email at steveg@apevibro.com. 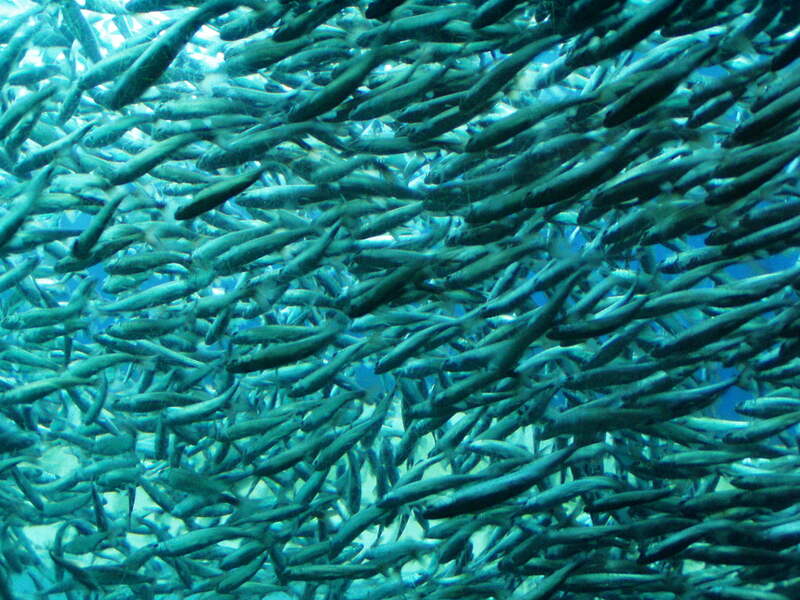 If you want to do your best to protect our salmon or other marine life while driving pile, why not choose a vibratory hammer to drive that next underwater pile? With such an emphasis on the environment these days, a recent definitive study commissioned last year by Caltrans on the issue of the effects of pile driving on marine life lists vibrating pile as the best pile driving method to protect Sea Life. In section 2.5 titled: Common Underwater Sound Reduction Measures, vibration of pile is listed as a preferred method to reduce sound in underwater pile driving compared to other pile driving methods. Evidence suggests it is the safest method for wildlife and the only method not to reach the dangerous 183db level. Attached is the entire report which is a must read for all you contractors driving underwater pile. There is also a ton of material about how to best handle underwater noise issues when driving any kind of pile with most types of hammers. Welcome to the first post to the new Noise and Vibration section of the APE Website. This section has been created to inform the public about projects and research in relation to the noise and vibration of piledriving hammers (vibratory, diesel and hydraulic). Some current and prospective clients may find this information useful when deciding and researching what kind of effects a hammer will have on the surrounding environment and wild life. This post references the pictures on the right from top to bottom. 1. 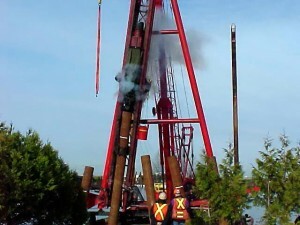 The first picture is a Fraser River Pile and Dredge using a sheet of carpet to hold back diesel smoke. 2. Here is an example of a “Hat” that has been done to make a diesel hammer quite on a jobsite in Florida. These are sound deadening mats that offer a considerable amount of noise prevention on around a jobsite.